In the moments leading up to the non-tender deadline, the Mariners managed to move second baseman Jose Lopez, receiving minor league pitcher Chaz Roe from the Rockies in return. Seattle was planning to non-tender Lopez, who was a major disappointment in his seven-year Mariner career. Lopez showed moderate power at times with Seattle, but his career has been marred by an inability to reach base, as shown by his triple slash line of .266/.297/.401. When Lopez was right, he provided some value. In 2006, 2008, and 2009, Lopez produced a wRC+ over 90 in each season and respective WARs of 1.7, 2.4, and 2.6. But 2007 and 2010 saw two offensive implosions, as Lopez only managed a 68 wRC+ in both campaigns. The result: -0.2 WAR in 2007 and +0.7 WAR in 2010. That 2010 mark was also based on a suspect +8 UZR at 3B, far different from Lopez’s reputation there (-7 FSR, matching up with what I’ve read from various Mariners outlets). So, what does Lopez have to offer the Rockies? 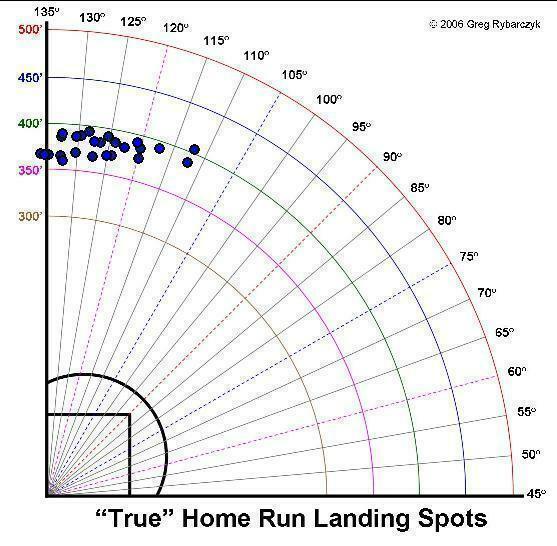 With the bat, one look at his home run chart (via HitTrackerOnline) should tell us. This chart is from 2009, but you won’t find much different with the rest of Lopez’s career. Only three of Lopez’s 73 HRs since 2006 have gone to the opposite field. Unfortunately for Lopez, he has played 81 games per season in one of the toughest parks for right handed batters to hit home runs, and, more importantly, pull home runs in that time frame. The move from Seattle to Colorado should help Lopez’s offensive game immensely. According to StatCorner, the park factor for right handed HRs in Seattle was a paltry 84 (only Oakland, St. Louis, and Pittsburgh play tougher) compared to a robust 117 in Colorado. The change in park isn’t going to make Lopez into an elite hitter- regardless of how much his power goes up, he just can’t take a walk. But, while it is true that every hitter fits better in Colorado than he would in Seattle, a hitter with Lopez’s profile should see an even greater benefit. Lopez doesn’t necessarily have to start, either. Between Chris Nelson, Johnathan Herrera, and Eric Young Jr., the Rockies certainly have other options for second base next season. Herrera, in particular, showed that he might be ready for a full time job in The Show, posting a .311 wOBA in 257 PAs last year. None of these options is by any means a sure thing, and Lopez could also serve as a backup for Ian Stewart as third base. Particularly with Clint Barmes gone, Lopez can either start at second base or backup both the keystone and the hot corner. It’s hard to blame Seattle for giving up on Lopez. He was among the worst possible fits for that ballpark and didn’t fit into the future of the organization. For Colorado, with some uncertainty at second base and at the least a need for depth, the acquisition of Lopez for cheap works perfectly. Both teams get what they want here, and now we get to see how Jose Lopez can perform in a park that isn’t designed to stop him. We hoped you liked reading Jose Lopez to Colorado by Jack Moore! Should Kevin Brown Be in the Hall of Fame? Lopez also had a +17 last year at 3d base, according to DRS. Total Zone had Lopez with a positive at 3d base (at least, according to comments I’ve read–I can’t access the TZ right now). At 2d base, for multiple years, UZR indicates he is average, and DRS says above average Given that all of the advanced defensive metrics indicate that he is a good defensive third baseman, is it possible that the fans’ defensive rating could reflect their disappointment over his offense. Most of the fan ratings come from fans of the specific team, and I don’t think they are immune to letting their disappointment / frustration with a player’s offense affect their defensive rating. It’s only one season of data. And if you’ve ever seen the way Lopez moves, you’ll understand why most view those positive numbers in a skeptical light. He’s serviceable at 3rd and has got a very strong arm – and maybe he’ll be even better than serviceable moving forward – but I think regression is much more likely if he continues getting time there. Yes, I understand your point. But there are multiple years of data at 2d base indicating he is around average at that position. I would expect an average 2d baseman (if he has a good arm) to become above average at 3d base. It doesn’t always work out that way, but Lopez looked pretty darn good at third base in 2010, and that’s after watching Adrian Beltre for 5 years. Lopez doesn’t charge particularly well, but his arm makes up for some of the extra time he needs to get the ball. That being said, when Lopez was was playing serviceable defense at second base, he was built like a miniature A-Rod. He’s currently on his way to being built like a miniature Carlos Silva. Historically, infielders with his body type (Ronnie Belliard, Carlos Baerga, etc.) regress quickly in their late 20’s. Comparables don’t mean much until after the fact so who knows, maybe Lopez has a long and successful career at the hot corner . . .but I wouldn’t bet on it.